The Eyes of the world Foundation was created in July 2001 by the current President Rafael Ribó and Vice President Borja Corcóstegui. The idea for the Foundation had begun half a year before, following the founders’ trip to Sahrawi refugee camps in Algeria to run a humanitarian aid project for the displaced population. In their preliminary six-day experience, the founders, along with a team of ophthalmologists and health professionals, carried out 200 eye exams and 35 operations. They were also able to equip Rabuni Hospital with the medical instruments and materials necessary to carry out similar work in the future. 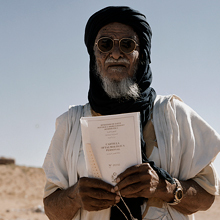 The perilous living conditions the team encountered in Algeria, coupled with the plethora of visual impairments encountered among the local population, lead the founders to realize a need for an organization that would work to improve the eyesight of the population, while at the same time better the local community. Thousands of people living in poor and developing countries suffer eye problems as a result of malnutrition, hygiene and health deficiencies, adverse weather conditions, and trauma suffered during war. Eye disease limits peoples’ ability to be self-sufficient, as it cripples their ability to work and care for their families. Eye disorders only compound the difficulties people from developing or underprivileged countries encounter in their daily lives. However, many of the eye diseases and ophthalmologic problems derived from the harsh living conditions, common in developing countries, are easy to both avoid and fix. Unfortunately, limited access to the means necessary to do so makes this work difficult in developing counties. Thus, Eyes of the world uses all resources possible to improve the living and visual conditions of those who cannot afford to do so themselves. We believe that for many people in the world, being able to see, means being able to live. Eyes of the world’s goal is to reach the poorest countries, where eye problems and pathogens are extremely common, yet there are neither optical nor ophthalmic resources. In the wake of the program that began in the Sahrawi refugee camps in 2001, we implemented a program in Mozambique a year later, followed by a project in Bolivia stared in 2003. All three of these countries, according to the United Nations, score poorly on the human development index. Also in 2003, as part of a World Health Organization project, we began a program in Gaza (Palestine); however, activities were suspended due to the political and armed conflicts in the region. The latest program implemented by Eyes of the world has been Eyes of Mali. 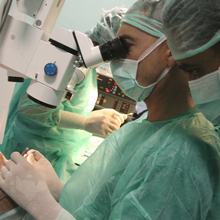 The Foundation has received cooperation proposals from organizations and government bodies from other countries in difficult ophthalmic situations, including: Togo, Mali, Guinea-Bissau, São Tomé, Sudan and Equatorial Guinea (Africa), Timor and Nepal (Asia), Brazil, Ecuador and Peru (South America), among others. The Eyes of the world Foundation has a network of almost 800 volunteers, including ophthalmologists, scrub nurses, optometrists, equipment technicians and other professionals from various cities across Spain and Portugal. Each and every one of them makes a generous contribution with their knowledge and skills in benefit of the people we serve. Furthermore, their work on the ground is possible thanks to the generosity of institutions, private businesses and people who collaborate with and support the Foundation, through financial or material contributions, and other, more indirect, routes. Based out of Barcelona, Eyes of the world is building a network of offices in Spain—locations include Andalusia, the Basque Country, Navarre, Valencia and Madrid. The Foundation also has centers in Portugal, France, Switzerland and Argentina. Eyes of the world also has an international presence completed by its participation on the advisory committee of the International Agency for the Prevention of Blindness, an organization that works with the WHO to promote VISION 2020: The Right to Sight, which aims to eradicate preventable blindness in the world by the year 2020. The IAPB is an organization, founded in 1975, with a goal of defining and coordinating common work strategies to guarantee the right to sight to everyone in the world. It comprises nearly 80 international organizations, including non-profit interests, ophthalmology care institutions, NGOs and private businesses.